The plan this morning was to do a bit of housework and head to the sewing room; however, plans changed when the sun came out. I hung clothes on the line even though it's about -3C and I went out to wrap two small shrubs and loosely lay some lights on a couple. I'll see if they'll be ok to hook up when hubby comes home and fix them more permanently. 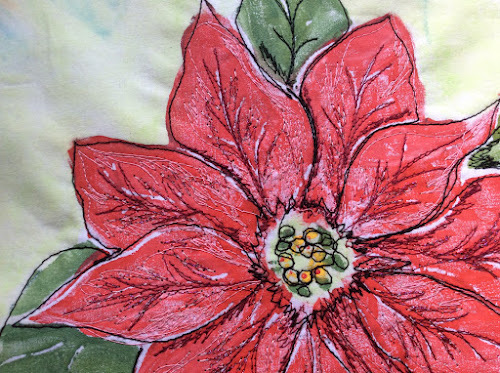 I headed to my sewing machine just long enough before lunch to set up some black thread in preparation for outlining the leaves on a mug rug and the second poinsettia. 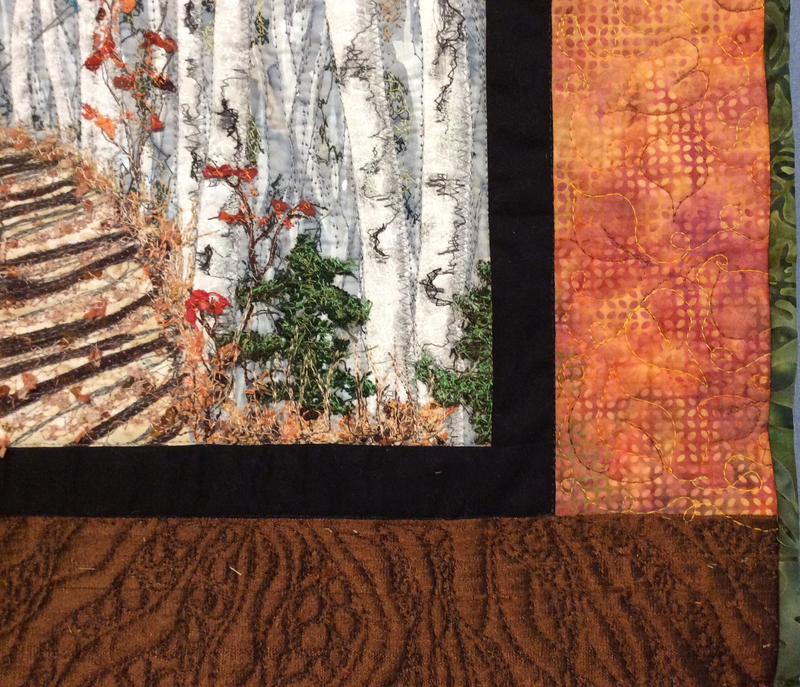 The mug rug was all quilted and waiting for the binding which is ready to go, but I wasn't enthused. Something was missing. 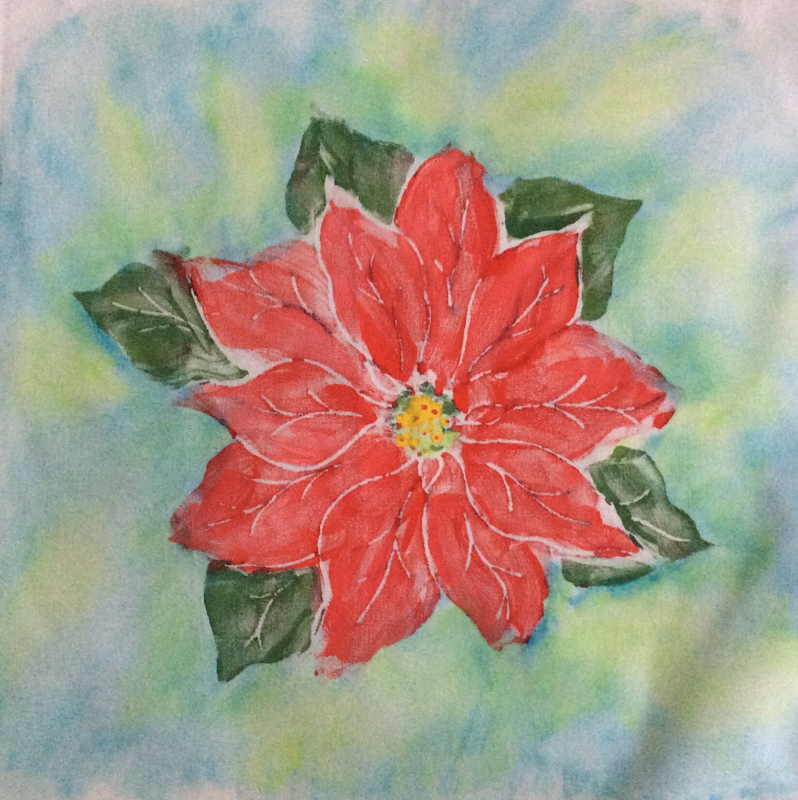 I added some fused leaves on top. I may get a bit more done after lunch before heading out for my tutoring session with a GEd student. The forecast was for 25cm of snow today. 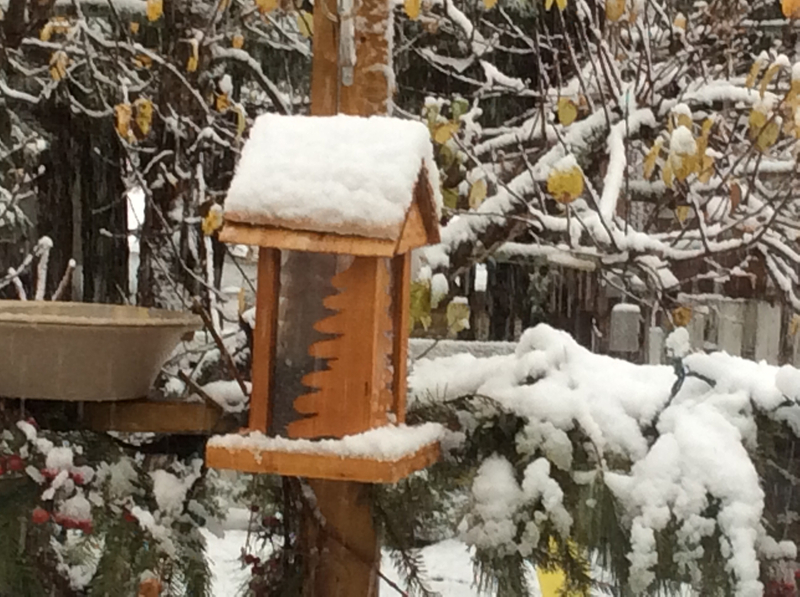 We got a few inches and it seems to have ebbed right now. Miserable to go for errands but pretty to see from the comfort of home. I'm anxious for the lights to come on at suppertime. I delivered a pumpkin chilli meal to a friend recovering from surgery and came straight home for tea and a rest. This morning I also went to the camera store to try out a tri pod to photograph my work. I'll need to put it on my wish list! I got out my second poinsettia print and added Neocolor II crayon colours around it, this time with some blue in it. I like it although it always dries paler than I'd like. 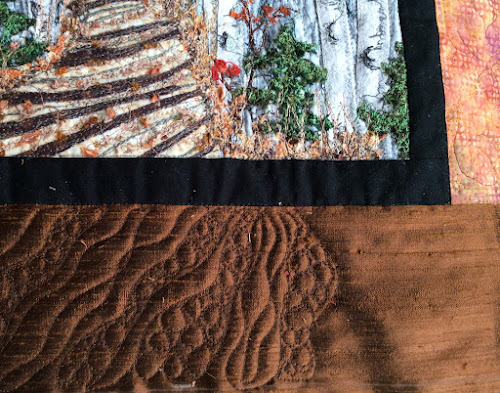 I think I'll add another layer before I stitch on it. Right now, I'm going to finish my tea with my feet up before I go put the honey garlic chicken breast that is currently marinating into the oven. 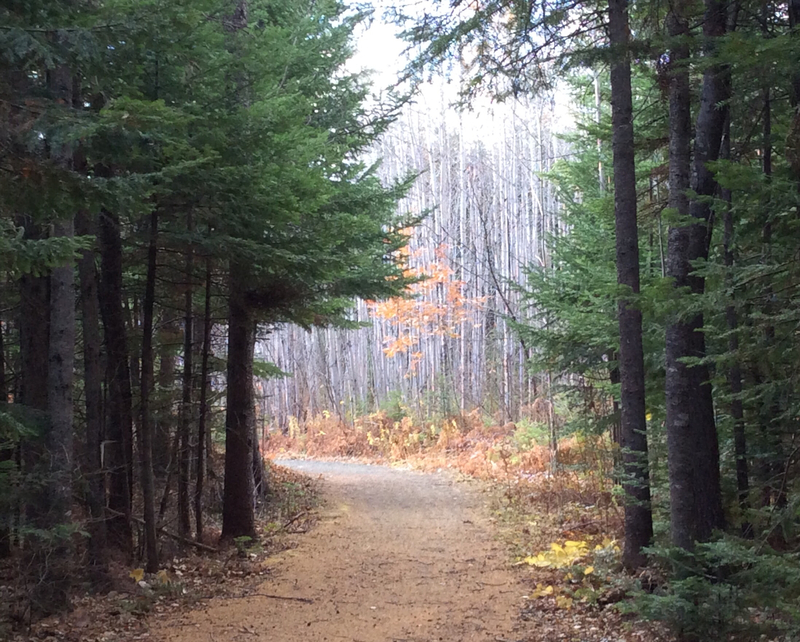 Yesterday, was a beautiful mild fall day, the kind that you just have to get out and enjoy. 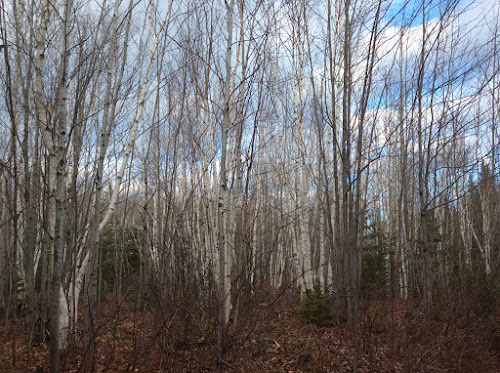 I cut my UFO day short to come home and get out to the trails to gather more branches. 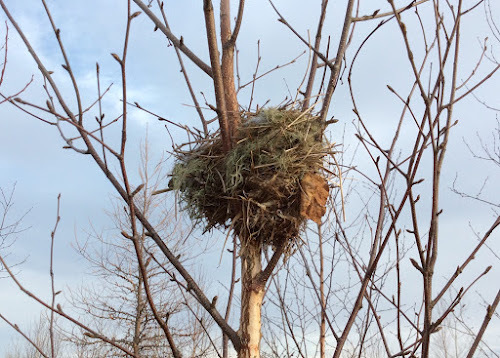 Hubby came to help and was the one who spotted the nest. I'm not sure what kind of nest it would be but here were lots of chickadees flitting about looking for food. Next time, I'll go prepared. 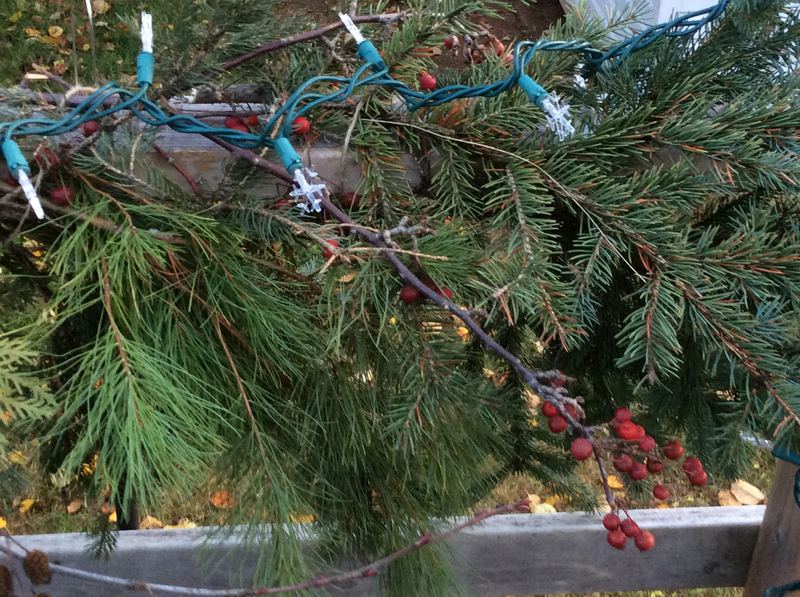 I even got started with the boughs across the deck. I haven't added in the reds yet and I plan to finish the corners with some boughs hanging vertically. I picked up the sweet little Martha Stewart snowflake lights from Home Depot. They're laid out to see the effect. The wires will be better concealed. 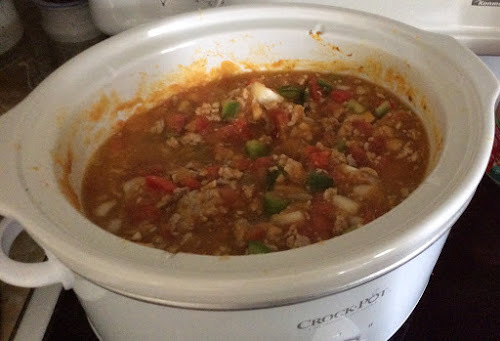 This morning, I put a pumpkin chilli (recipe from Pinterest) in the crock pot. Then I went to the sewing room for a half hour, putting away my things from yesterday. 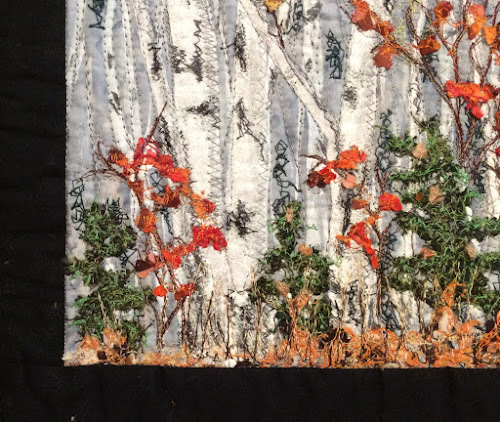 I've finally finished my fiber art birches! Yippee! 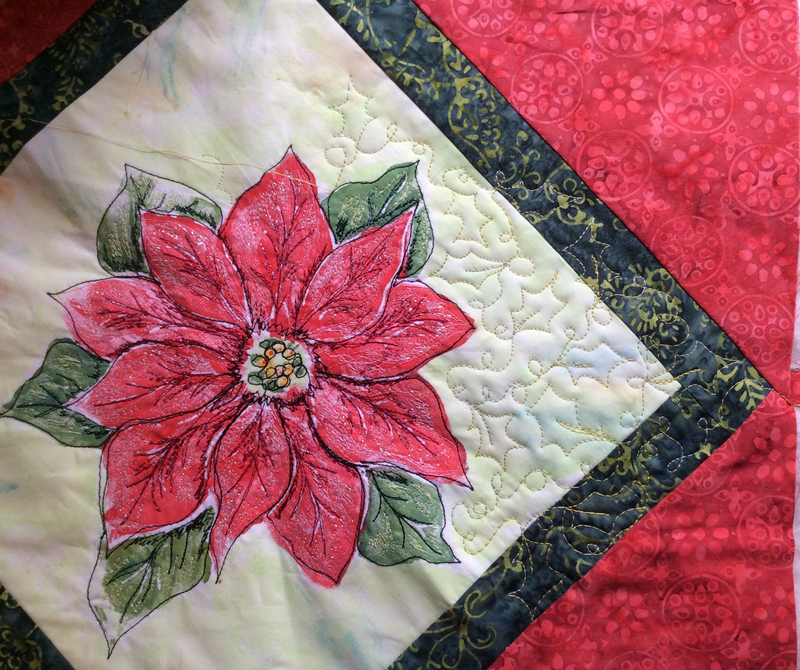 I had a few minutes to test out the free motion quilted holly leaves on the poinsettia. It's going nicely. 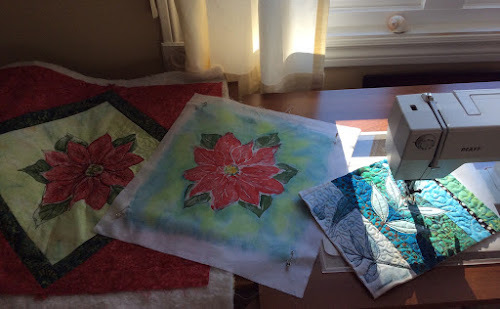 I think I'd like to do the second one and make cushion covers for my living room. Time will tell. I am anxiously awaiting an appointment with the neurologist on Thursday to see what he says about the MRI and the pinched nerve. I hope there'll be a solution besides all the painkillers! 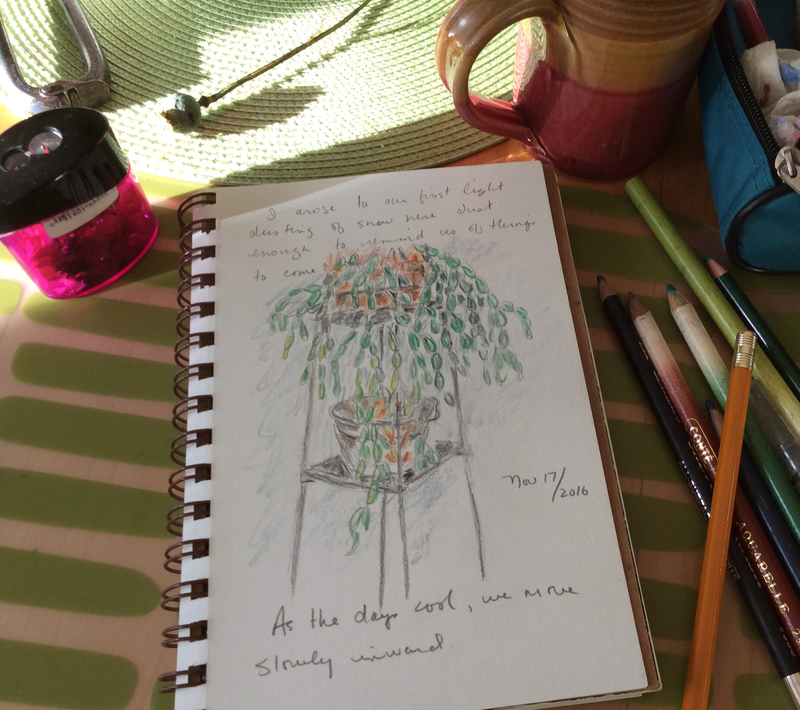 My morning began with breakfast, tea and a small sketch. 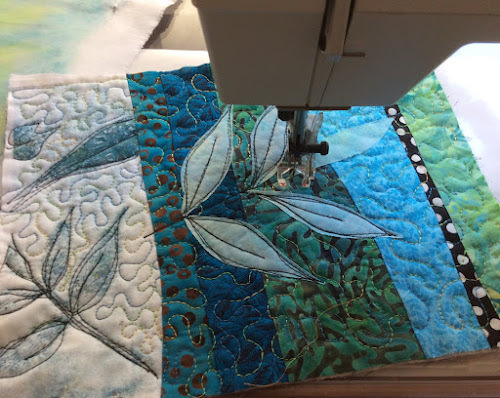 My sewing time is broken up with rest periods in between. 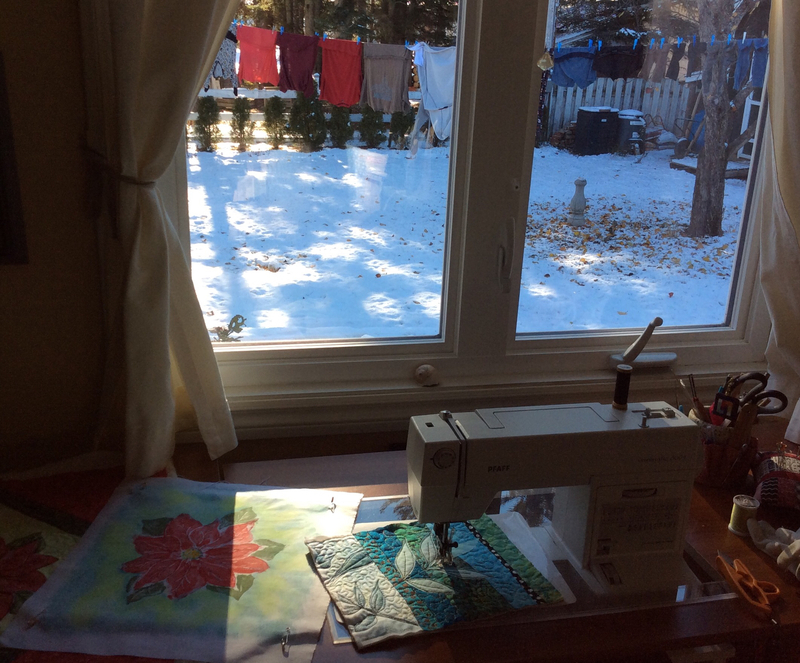 I was happy to spend some time in the sunny studio today. 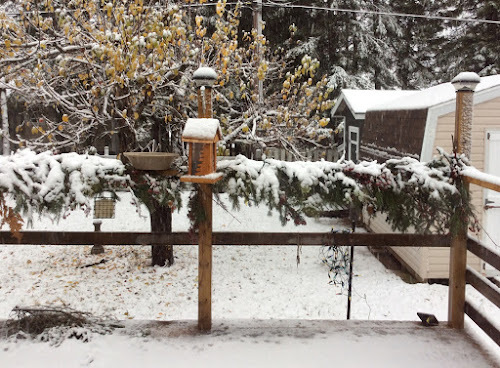 We had a very light dusting of snow overnight and the temps today were around 2C when I was out. Lovely, sunny and not windy though so quite pleasant. As many of you may know, I love a line of clothes. Finally, I sewed the binding onto my birches. I'm so happy to be getting to the end, as I very much want to move on to some Christmas sewing and to be able to post things again. I can only show a sneak peak. I used two colours in the binding because of the different fabrics in the border. 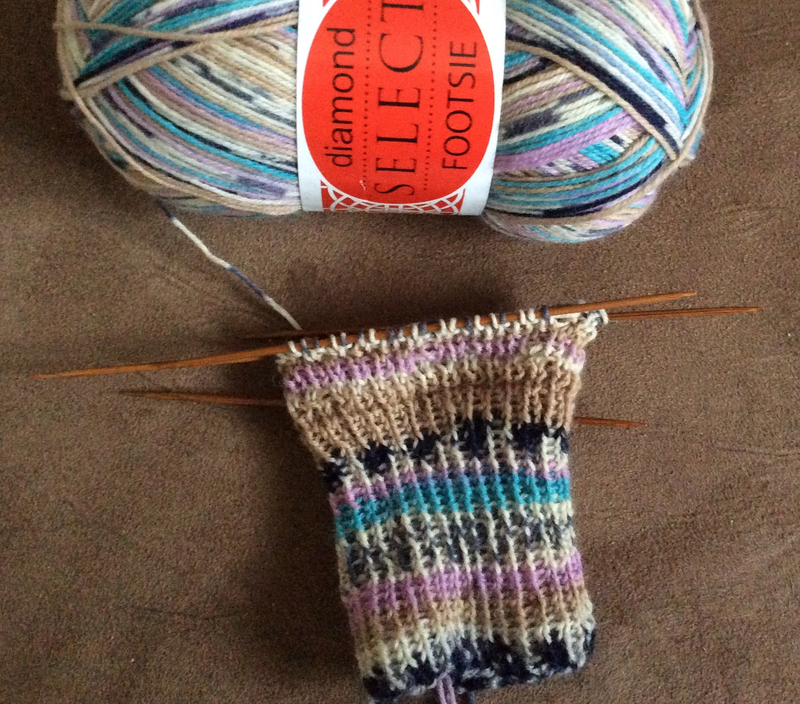 When I need to put my legs up and use heat and ice, I can turn to some knitting. 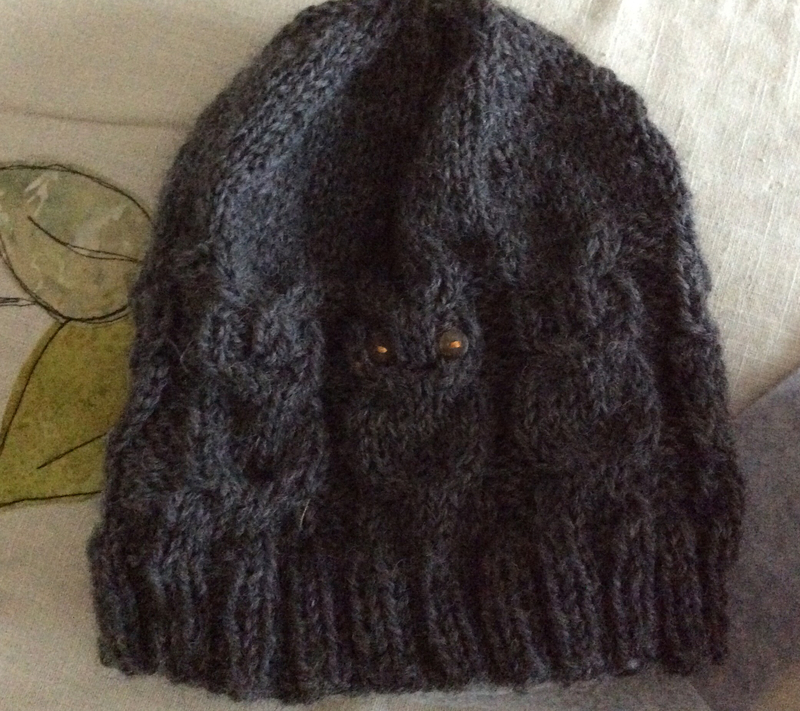 I'm into these owl hats which I knit with wool and line with fleece around the bottom. 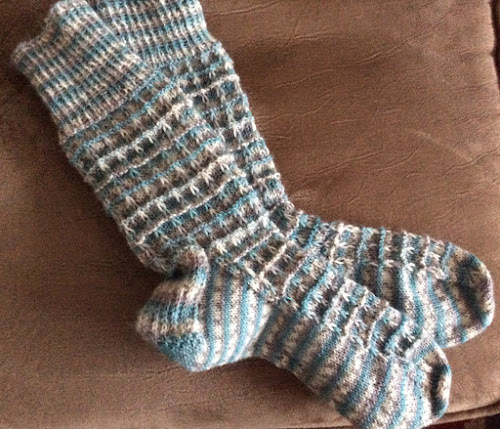 I finished a pair of socks. And started new ones yesterday. I'm even getting shoulder and elbow issues so I have to limit the knitting too, lol. I'm a mess! Things have been a little slow and quiet here recently. I'm not myself. Some of you may know I've been dealing with some arthritis and joint issues plus a recently diagnosed pinched nerve in my spine. On top of that, I'm waiting for do sinus surgery to remove polyps and surgery on my knee for a torn meniscus. I know, I'm a wreck! I'm seeing the neurologist in a couple of weeks to consult about the pinched nerve now that I've had the MRI. In the meantime, the pain has increased to a sometimes unbearable point. I've been increasing all my medications and I'm taking heavy duty painkillers. All that adds up to less time in the studio. My mind and my ideas keep chugging along though and I keep a notebook nearby lest I forget all the 'inspirations' as a result of my brain fog. 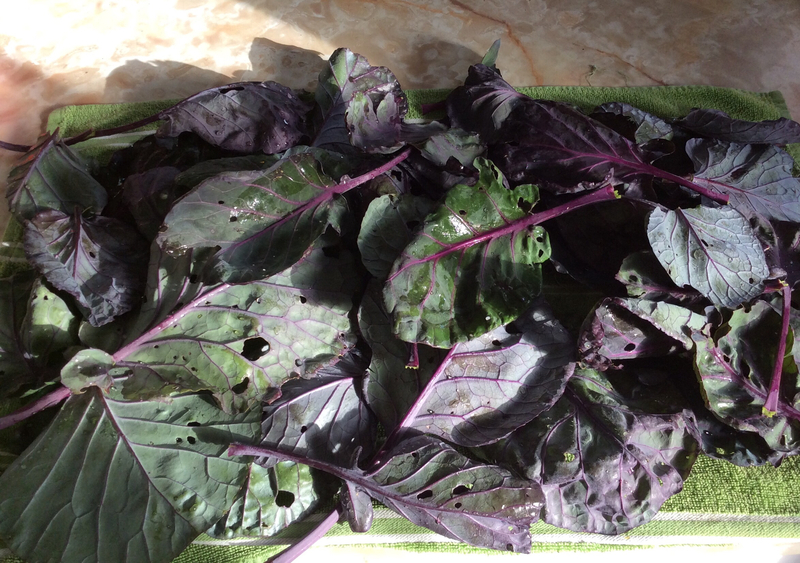 Today, I am feeling pretty satisfied that I managed to get outside and pick some of my kale. It's the last thing in the garden and it will soon freeze. I want to make some kale chips which I love to crumble atop a salad. 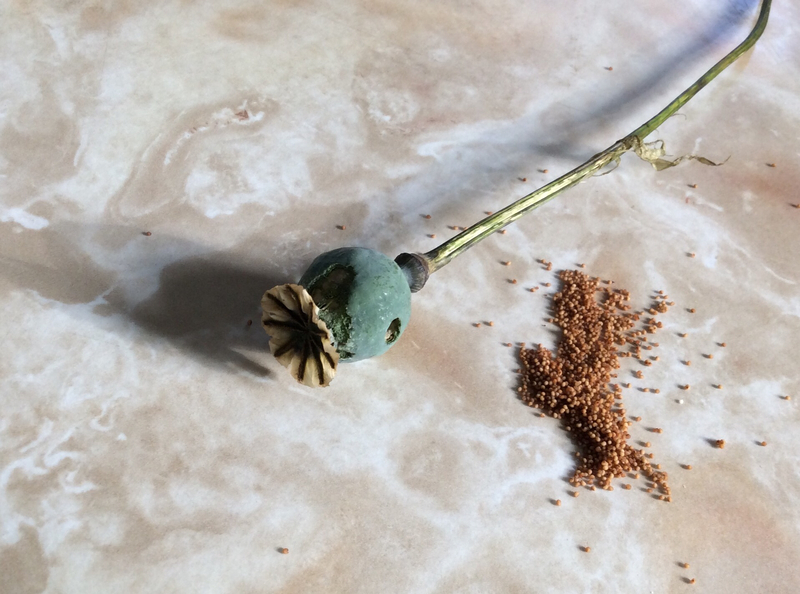 While out there, I noticed one poppy seed head. 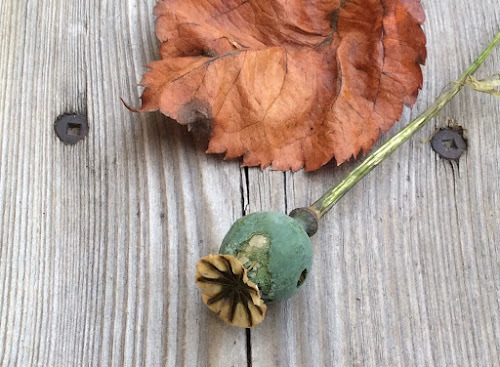 These are annual poppies. The seeds were sent to me by a fellow blogger and I'll be so happy to let her know that I managed to harvest a few seeds. 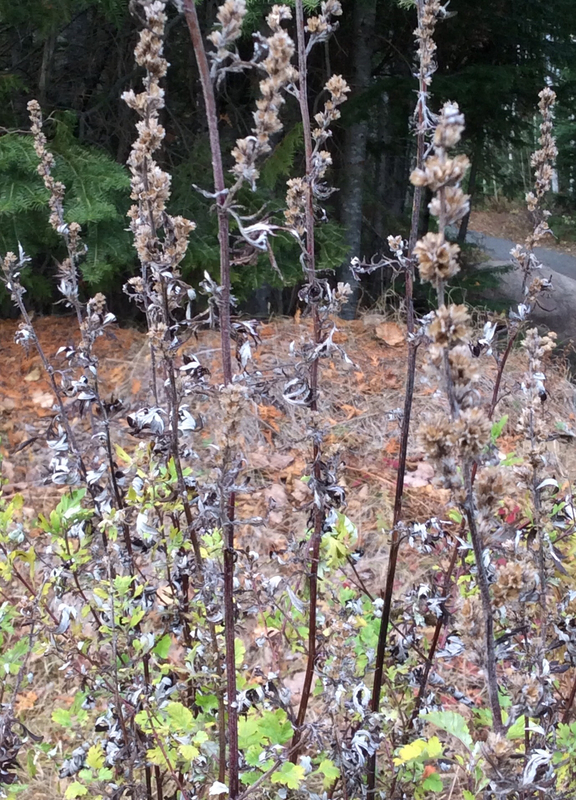 The seed heads are so pretty, aren't they? Such tiny, seemingly insignificant things, but they really do bring happiness. 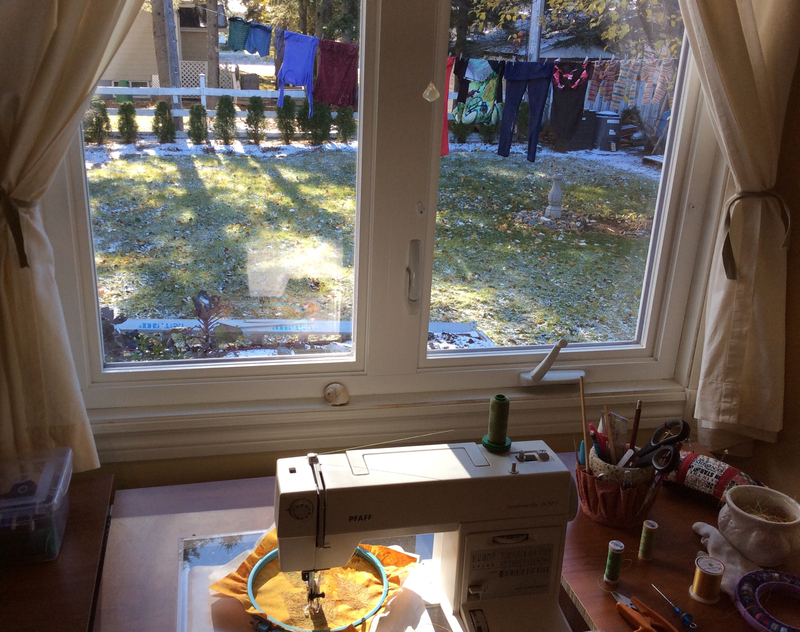 After a rest involving heat and ice packs, I then went into my sewing studio. 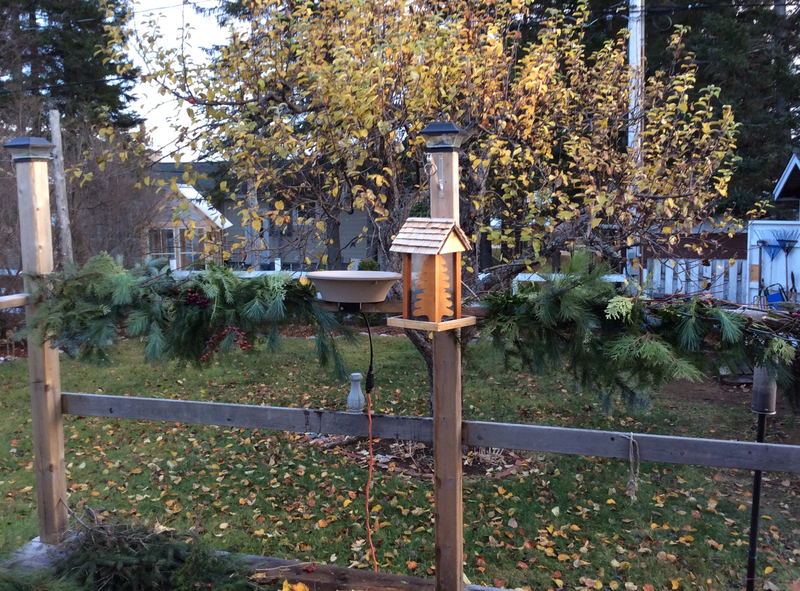 My husband finally got the sheds in place in the yard and cleaned up the paraphernalia that was around them. 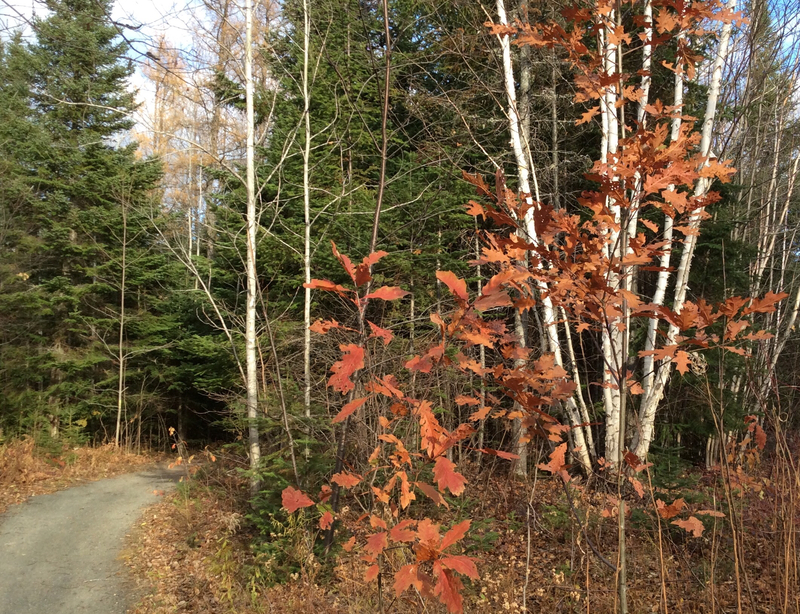 The apple tree is always the last thing with golden leaves still clinging to it. Next year, the plan is to add a bit of shrubbery to camoflage the compost bins in the back corner. They were behind the sheds but it was too difficult for me to get to them there. The bird bath and all the garden ornaments have been put away and we've moved the feeders near to our deck for better winter viewing from inside. 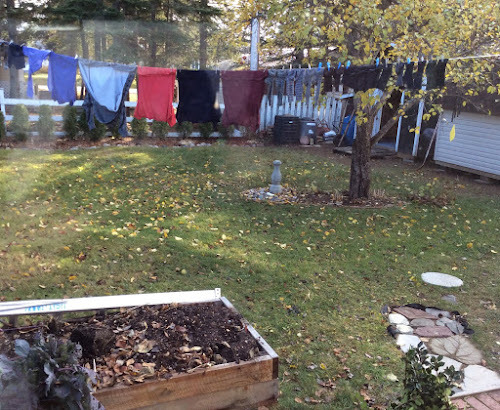 My husband filled the raised bed with a layer of leaves and compost. I love a line of clothes don't you? 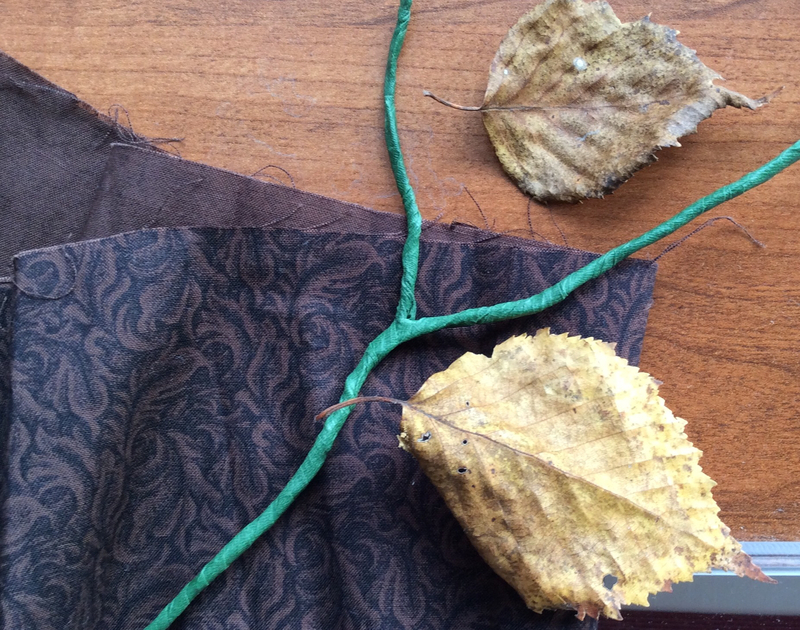 I am experimenting with making a small birch branch which I fashioned from wire and wrapped with floral tape. Next, I will wrap it with brown fabric. I wrapped my electric heat belt around me and did some free motion stitching onto some hooped leaf coloured batik. There is a layer of heavy disolvable interfacing on the bottom. 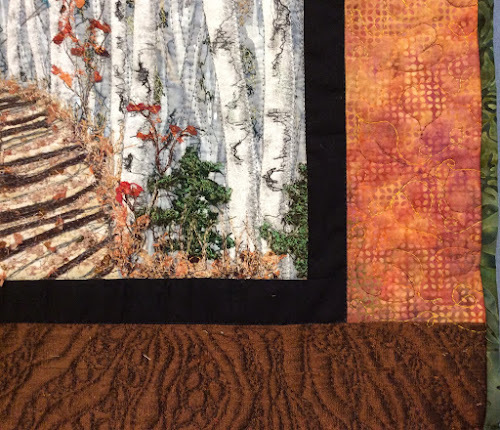 Once I've layered enough thread colours, I'll rinse it and carefully cut them out. I'm hoping some added starch will give them some shape. 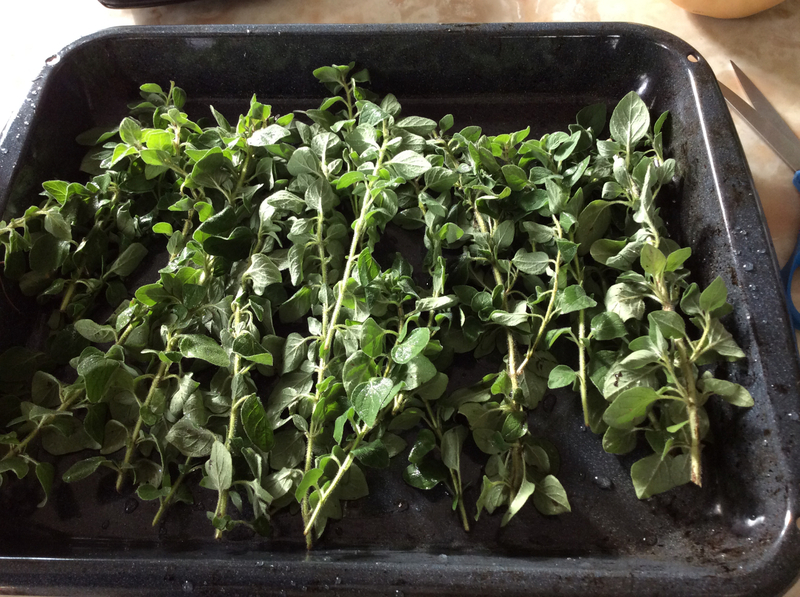 It's all experimental at this stage. 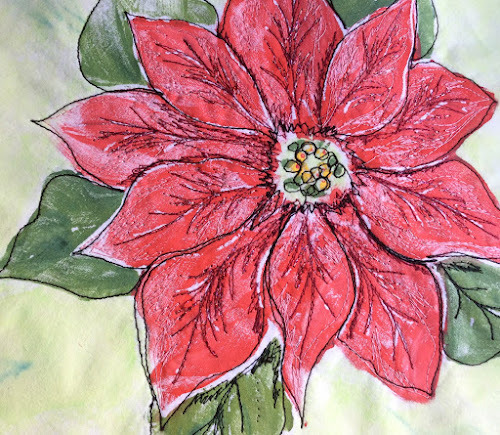 May you're weekend be restful and creative in some small way. It really can ease what ails you. I've been t spending a rather quiet and pensive Remembrance Day, doing a few things around house and garden but also,resting also and thinking about wars past , present and future. Ever hopeful for the future. 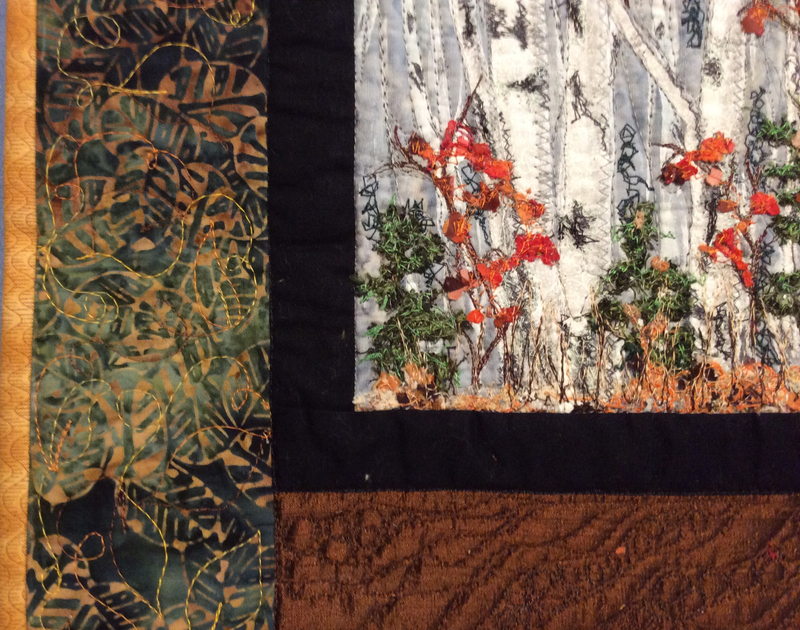 I just discovered CBC radio's livestream of Canadian composers and listening as background while I got the quilting finished on the birches. 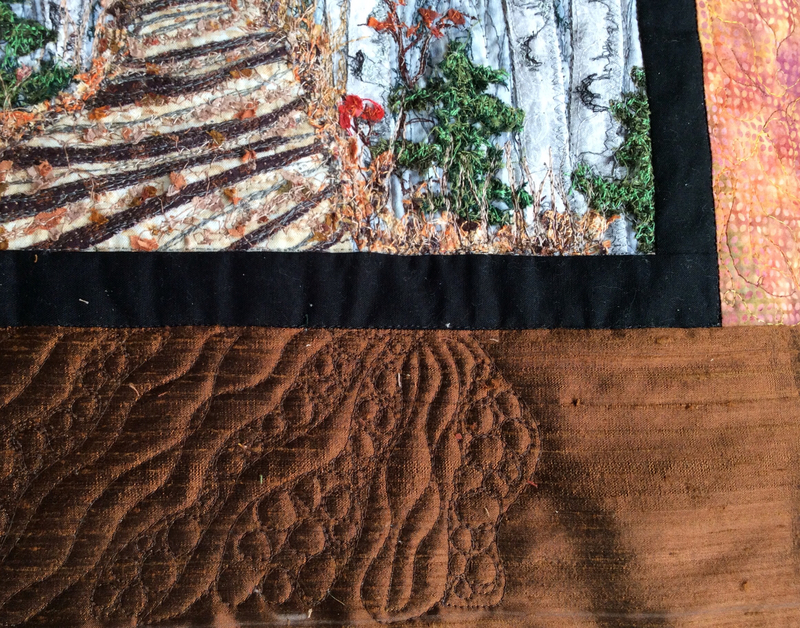 I'm on the last section of the border on the bottom. The horizontal woven threads are bothering me. They seem to mess with the curvy,organic feel, but cest la vie. It's there and I'm not ripping. 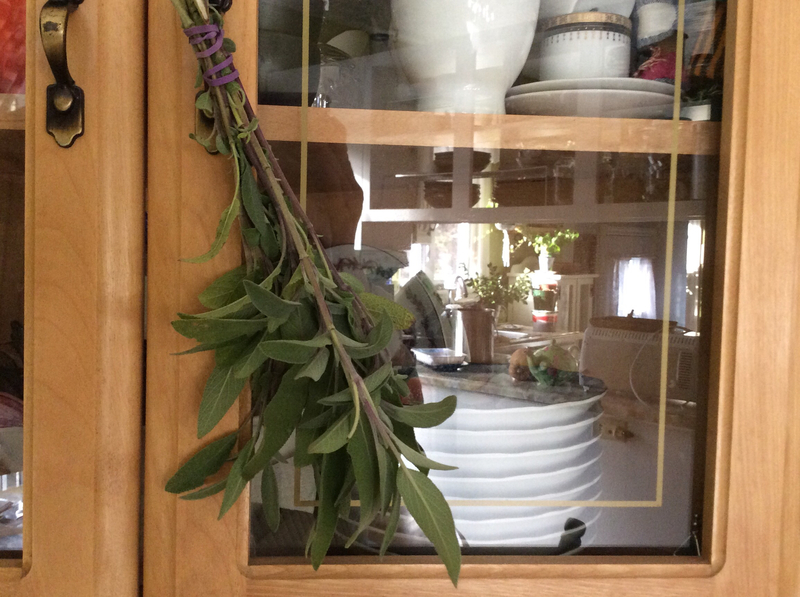 This morning, I cut the last of my herbs from the back door garden--sage and oregano-- and brought it in to dry. I've been having a lot of back and leg pain from the pinched nerve in my lower back. I'm very happy to be seeing the neurologist in 3 weeks. I've found that the sauna and hot tub at the spa seem to help, so I'm changing and heading over. I'm about 2 minutes away. Well, I have been away to visit family and to see the orthopaedic surgeon on my way home, combining a necessary trip with a quick jaunt to PEI to stay with my sister. I spent some quality time with her, my mother and my daughter. 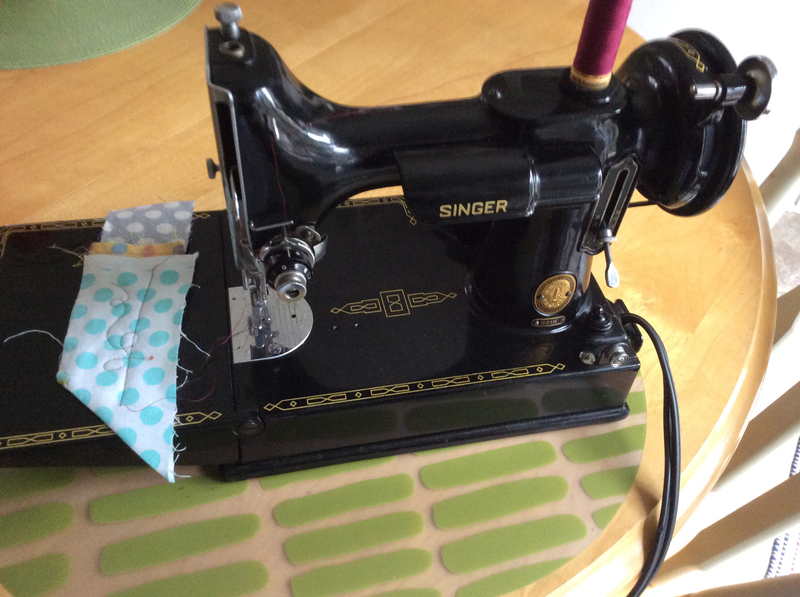 For a short time, I thought that the Singer Featherweight which was my mothers and on which I learned to sew had disappeared. My mother who has been diagnosed with Moderate Cognitive Impairment, possibly leading to Alzeimers, couldn't remember where it went. My sister was busy and only noticed my queries after I had fretted for a while because she was busy. I was so happy to hear that she had it and I was able to bring it back with me. It also has the black wooden carrying case and the table which it can set into. I couldn't resist giving it a little test run and it sews like a dream. 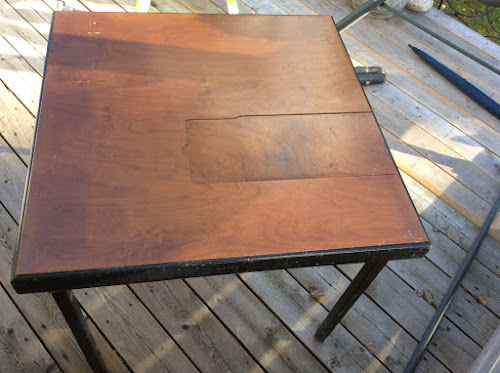 I won't sew with it though until I get it cleaned and oiled. I got results from my MRI at the meeting with the surgeon. He showed me the pictures where I could see the marked tear in the meniscus of my right knee. Surgery in about 3 months, I hope. He also showed me the collapse of the L4/L 5 joint in the spine where the nerve is being pinched. I have an appointment with the neurologist in a few weeks to consult about that. 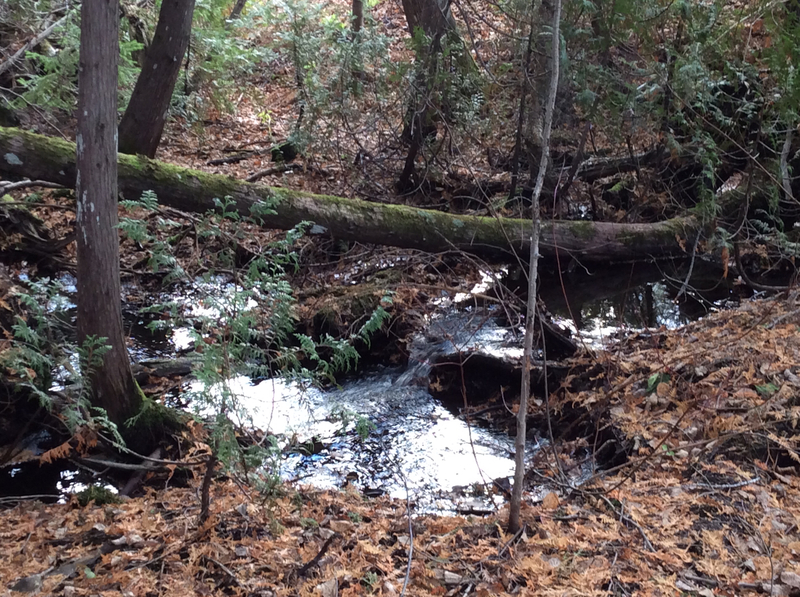 So, things are moving, however slowly, but positively toward resolution for some of my issues. I'm optimistic in between my bouts of frustration. Today, I went to our guild UFO day which I always enjoy. It is such a happy place to spend time and it passes much too quickly. 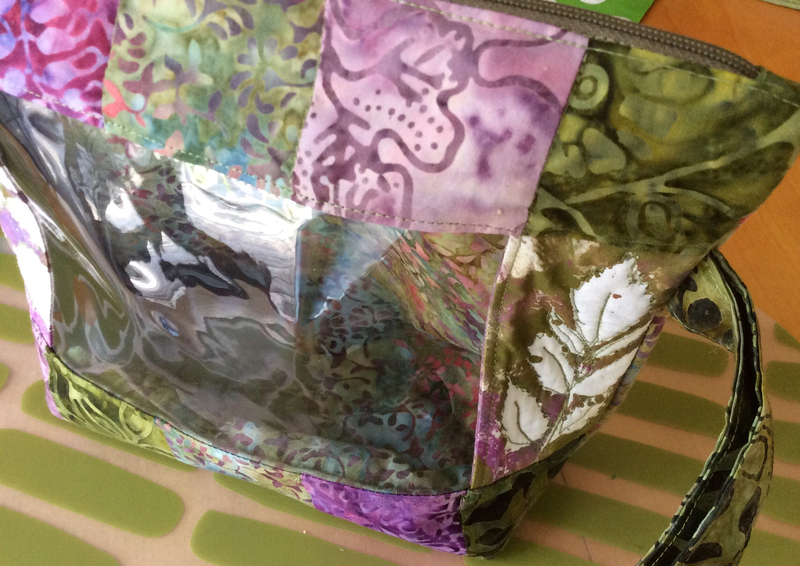 I did manage (with help from my friend Sue) to finish this bag finally. It is the smaller version of the This and That bag from byannie.com. 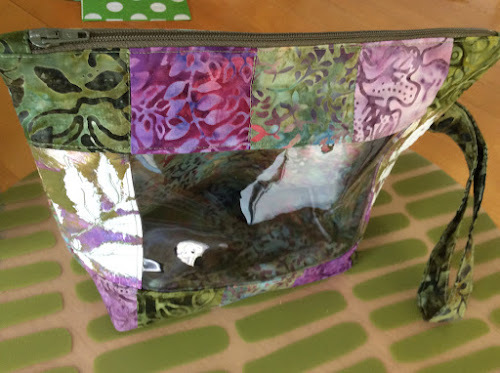 I used bits of my Gelli prints on each side of the bag. It makes a unique and personalized gift. Around mid afternoon, I came home and dressed for a walk. It was cold and blustery as November can be, but I drove to the part of the trail that I love and it was sheltered from the wind. I have walked here many, many times, and it is always beautiful no matter the month, the season, or the weather. It is always in transition and never the same. 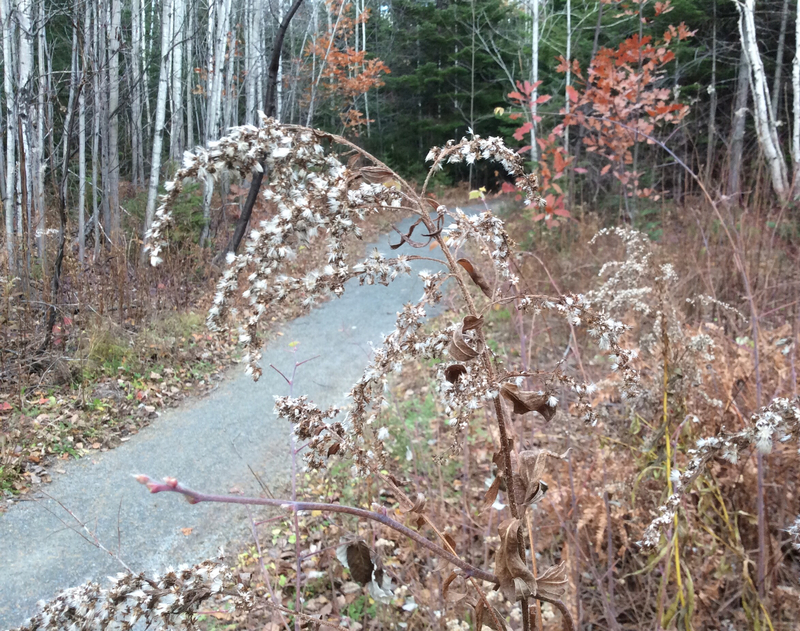 Most of the colourful leaves are down. 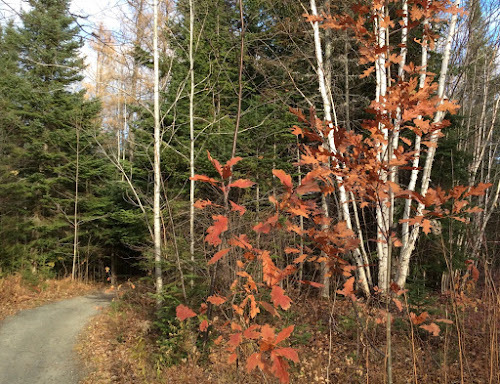 Here and there are splashes of color. I can't walk very far or long but there is so much to see, I don't need to. 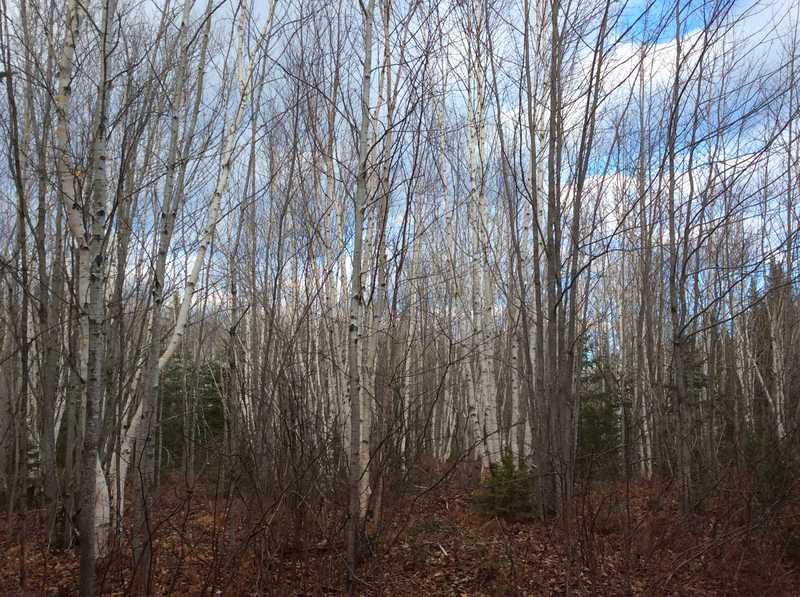 My eyes are drawn to the now softer colours of the birch grove. I wonder how many times I've photographed this scene. Then, there are so many plants in their dried form that catch my eye. 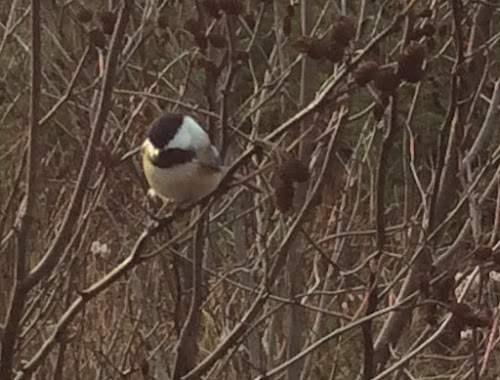 When I'm out more often I will notice them early in the season and be able to identify them but some I have not seen. 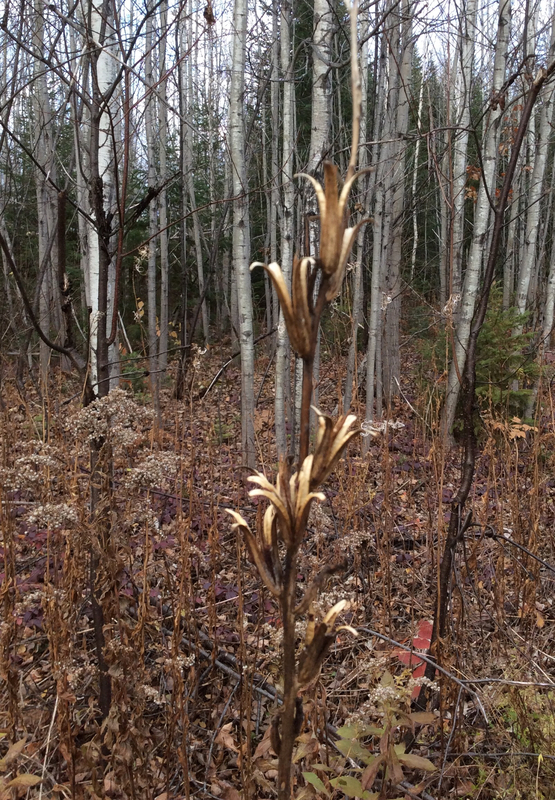 The dried seed heads and leaves were almost glowing. 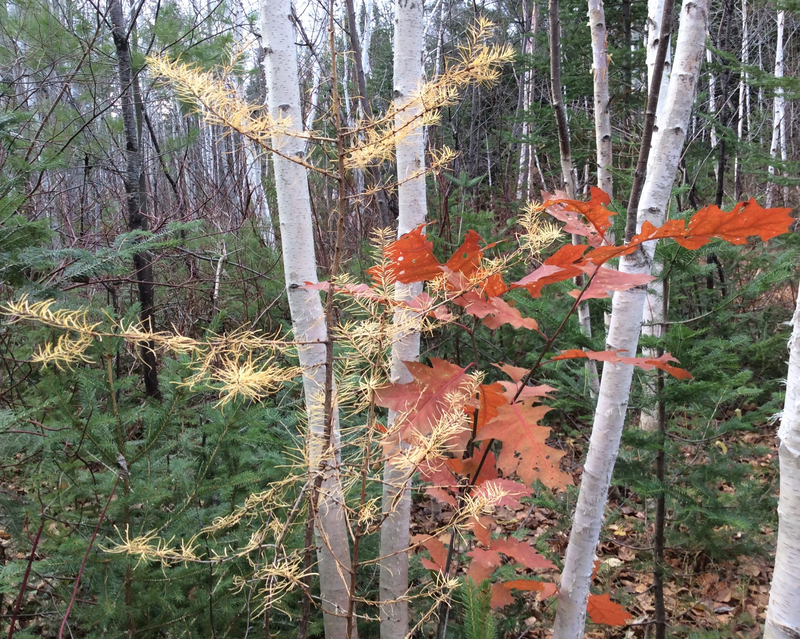 When I first spied this one, it looked in the sunlight as if someone had sprayed it gold. And the shapes are fascinating. Just look atthe color here! 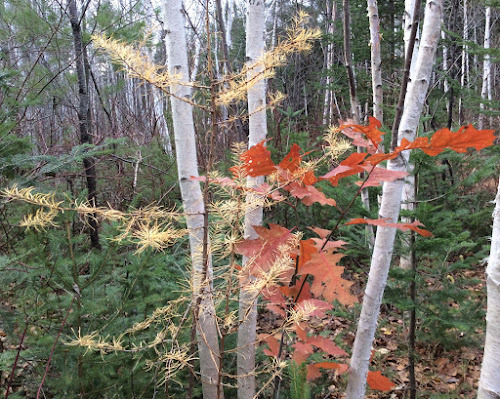 I love the delicate etchings of the gold needles-- tamarack, I think. I covered such a short distance and now have some pain down my legs but I saw such beauty that will keep me inspired for a while. I'm writing a quick post to update the bit of progress on the poinsettia as I'm leaving tomorrow for a few days to visit family. 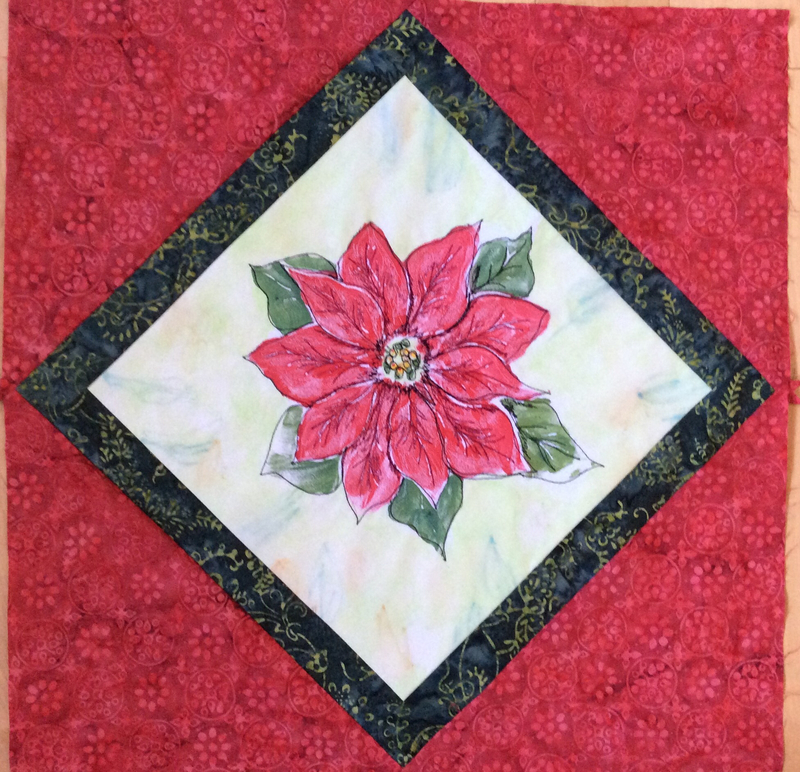 Over the weekend I added small borders and half square triangles. This morning, I started to add some green stitching on the leaves and ran out of bobbin thread. Don't you hate that? Of course I'm never organized enough to have more ready! 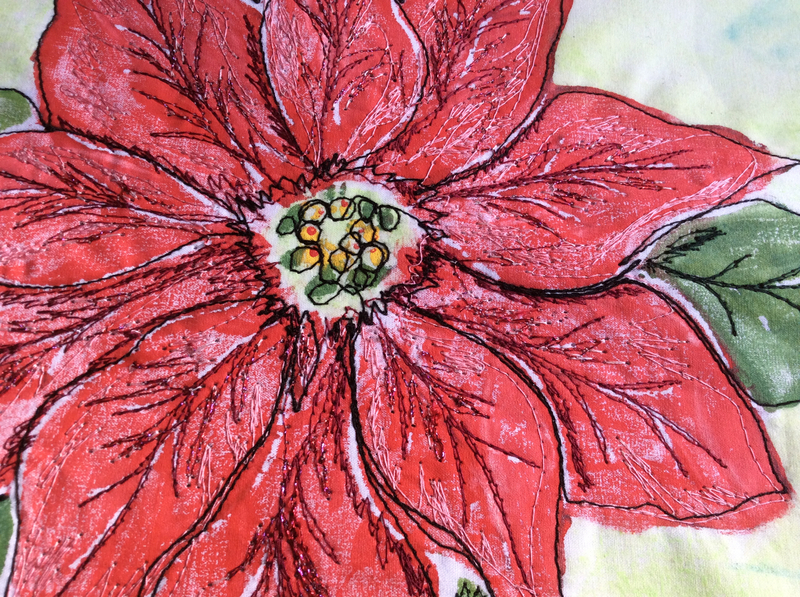 I really wanted to add some metallic sparkle using a red/silver metallic thread. I tried a couple of needles. The metallic needle shredded the thread, so I switched to an embroidery needle. 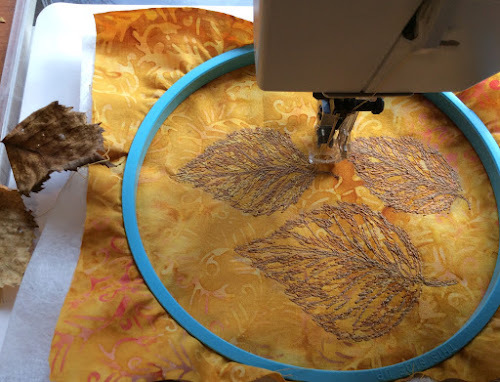 I thought of adding a few drops of Sew Smooth to the needle and the thread which seemed to work. I tried every angle and various lighting to pick up the sparkle with little results. I can't decide if this will be a table topper or a Christmas pillow cover. It measures 19" square.